My collection of coins which represents the rich culture and long history of India. From the 14th to the 18th century, there was trade between Venice and the ports of western and southern India. Traders brought Venetian gold coins known as ducats and sequins to India. Besides the coins minted by various Indian rulers, many foreign coins too were used in certain parts of India during different periods of history. Merchants and traders brought these foreign coins to India. During the early centuries of the Christian era, thousands of Roman gold and silver coins reached South India. It is believed that these coins were used as money or currency in places such as Muziris in Kerala and Madurai in Tamil Nadu. During the medieval period (fourteenth to eighteenth centuries), Venice in Italy traded with the ports of Western and Southern India. Marco Polo was the most famous Venetian traveller who visited India. The Venetian traders brought Venetian gold coins to India and these were issued by Venetian rulers — Francis Lorendano, Paul Rainier and Peter Grimani. The obverse of the coin. The Venetian gold coins were known as ducats and sequins. They weigh around 3.5 grams. The obverse of these coins feature the figures of St. Mark and the Doge or the chief magistrate or ruler. The reverse features Jesus Christ standing within an oval of stars. 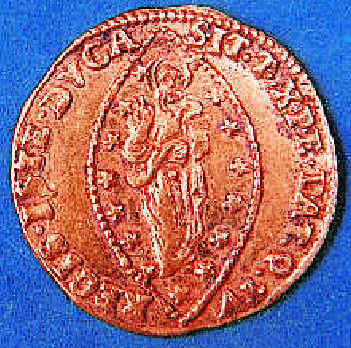 The Venetian coins were in great demand in medieval Kerala. The Indian rulers purchased these coins as gifts for priests and scholars. As these coins bore the figure of St. Mark, they were regarded as sacred objects by the Syrian Christians of Kerala. 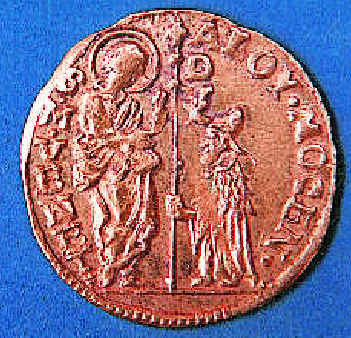 Many Syrian Christian ladies wore necklaces made of Venetian coins. Some Indians called the Venetian coins sanar kasu because the figures of Doge standing in front of St. Mark's cross on these coins appeared like a toddy drawer (sanar) preparing to climb up the Palmyra tree. The arches on the reverse of these coins resembled a bow or villu and called villu kasu. The Indians even produced imitations of these Venetian coins. One such imitation coin bears the figures of the Hindu deities Rama and Sita on the obverse and Lakshmana on the reverse. Personal blog of Arun J. Powered by Blogger.